In his address to the philosophers at the Areopagus, the apostle Paul demonstrated that he was conversant with the ideas and culture prevalent in the first century. Unless we understand modern philosophical assumptions and common objections to the Christian faith, we will not be able to recognize theological error or present a compelling case for trusting in Jesus. 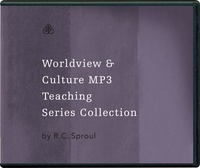 The topics found in this 272 message MP3 collection include philosophy, apologetics, ethics, Christianity and culture, and the arts. Series included (average of 6 messages per series): Abortion: A Rational Look at an Emotional Issue, Apologetics of the Early Church, Battle for Our Minds, Blueprint for Thinking, Choosing My Religion, Christian Ethics, Christian Worldview, The Christian Mind, Christian Evidences, Church and State, City of God, City of Man, The Consequences of Ideas, Creation or Chaos, The Cross and the Crescent, Cultural Revolution, The Dark Side of Islam, Defending Your Faith, Islam and Violence, Objections Answered, Objections Answered Extended Series, Orlando 2002 Nat’l Conference — War on the Word, Orlando 2007 Nat’l Conference — Contending for the Truth, The Psychology of Atheism, Recovering the Beauty of the Arts, Silencing the Devil, Tearing Down Strongholds, Truth, When Worlds Collide, Worldviews in Conflict ($544 value).